Happy New Year! It’s Andy Gesner and the staff at HIP Video Promo wishing everyone tons of continued success in 2004 and without missing a beat, we are here for you with one of our first video campaigns of the new year. We truly appreciate all of your support in 2003 and promise to keep the compelling, distinct and dynamic videos coming all throughout the new year. 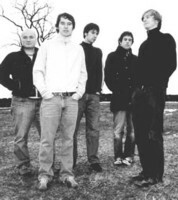 It was a personal highlight of 2003 getting to work with Seattle based Tooth and Nail Records; especially MAE, a visceral and vibrant indie rock quintet from Norfolk, Virginia. Fueled by remarkable passion for their art and plenty of tenacity and heart, MAE spent almost the entire year of 2003 spreading their luminous charisma across the country on tour and matured as a cohesive musical force. The video displays the band members performing, alternately individually and collectively, against an ever changing visual cornucopia of animated objects: architecture, guitars, cardinals (Virginia’s State bird), envelopes (of course), and various cautionary and admonitory signs, among other things. Distinct from other examples of the object animation technique you may have seen, directors Anastasia & Ian make sure this clip lacks the typically frantic pace – rather, it has an easy groove that meshes with the song’s pensive feel. Here at HIP Video we are fully prepared to stock you up with MAE merchandise, including copies of their critically acclaimedDestination: Beautiful CD. Mae will be on tour this month and next and we have tickets for giveaways. The band is also available to do video interviews and video IDs while they are out on the road. Tooth & Nail and HIP Video are also joining forces to bring you “Tooth and Nail New Years Celebration” contest. Any programmer that adds the Mae “Embers and Envelopes” video for the add dates of January 16th and January 19th will be entered in a drawing to win the complete 2003 Tooth & Nail catalog (lots of cool bands), along with hoodys for the winter and t-shirts for the summer. Call Andy Gesner at HIP Video Promo at 732-613-1779 or e-mail HIPVideo@aol.com to get all your Mae updates.